Join us this Sunday April 19th at 3pm for an amazing collaboration, an extraordinary musical event: NEXUS in concert with Paul Winter and Prana! (Click here for Ticket info). 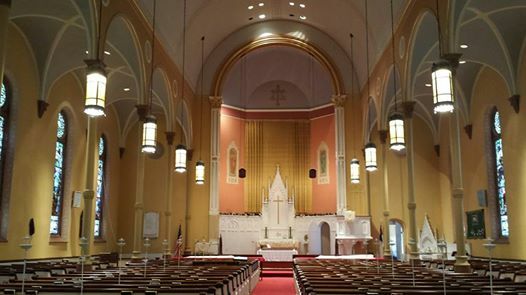 Look at this beautiful setting: Trinity Lutheran Church, one of the largest and oldest “cathedrals” in the town of Kingston, New York . Our own Garry Kvistad has been instrumental (if you will pardon the pun) in bringing this collaboration to fruition. He calls the combination of Paul Winter, the overtones singers Prana, and NEXUS the “Harmonic Orchestra” and at this concert they will be premiering many works and featuring instruments built especially for that space. Garry says he chose this church because of its fantastic acoustics. 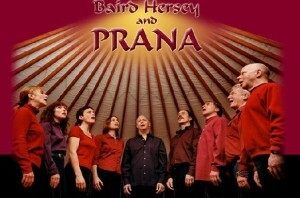 Prana, under the direction of Baird Hersey, have an unusual style of “throat singing”: the singers use their regular singing voice instead of the low gravely drone characteristic of the Tibetan and Tuvan sounds. They apply the fundamental overtone techniques of these older traditions to the “natural voice” to sing two mellifluous pitches at once. Singing as a group in this unique style they create beautiful rising harmonies, shimmering vocal textures, and high arcing melodies. 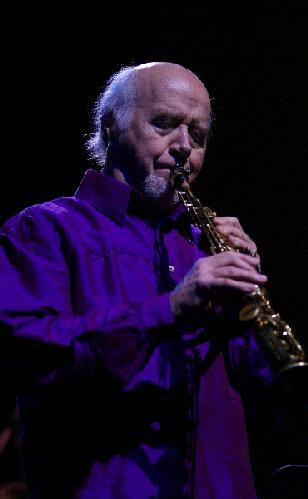 Saxophonist and multi-Grammy Winner Paul Winter will bring his own brand of excitement to this special event. 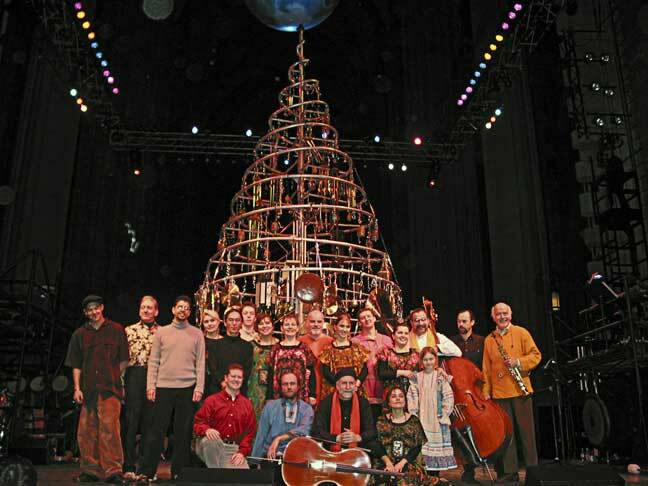 Noted for his unique collaborations, world-wide tours and Winter and Summer Solstice Concerts at the Cathedral of St. John the Divine in Manhattan, Paul has close ties to NEXUS: Garry created many of the chimes in the Paul Winter Consort’s revolving “Solstice Tree” musical sculpture. Bill often performs with the Consort and in 2006 received a GRAMMY Award as part of the Paul Winter Consort on the DVD titled, “2004 Solstice Concert.” Bob, too, toured as drummer/percussionist with the Consort. Paul is renowned for his numerous recordings, amazing jazz improvisations and inclusion of sounds from nature in his performances. 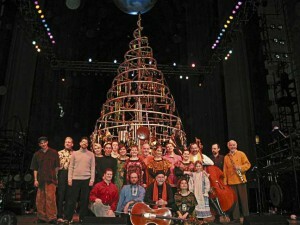 Here’s a photo of the Solstice Tree, Paul is far right, and Bill is second from left. You might be interested in Bill’s stunning description of the 2009 Winter Solstice performance with Paul in which he participated: click here. So many exciting Spring projects!